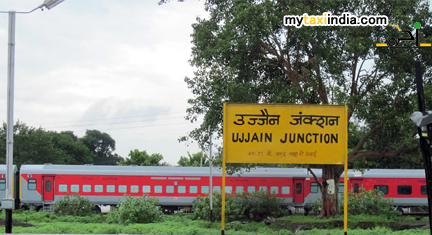 Ujjain Junction is the chief railway station of Ujjain City situated in the western part of Madhya Pradesh state, India. For passengers, the station is equipped with several modern waiting halls, 5 Ticket Counters (3 reserved, 2 unreserved), E-Ticketing facilities, Internet Café, Food Plaza, STD and Primary Booths, Pizza Hut resturant, rail restaurant, availability of mineral water, rail restaurant, special compartment for ladies, toilet and sanitation, RO vendors, and a special Darshan Grah. It is said that the railway station of Ujjain will be transformed into world-class quality station. In the year 1999, the station was awarded an ISO Certificate by the government of India. Ujjain being the historical city of Central India is an ideal tourist destination for people across the globe. Located in the Malwa region, Madhya Pradesh state and surrounded by the holy waters of the Shipra River, the region is considered as one of the seven major sites of Hindu pilgrimage. Ujjain city is considered as a holy city for the Hindus as it is also the site for the triennial Kumbh Mela. Mahakaleshwar or the Mahakal shrine is worth visiting in Ujjain. The shrine is dedicated to Lord Shiva. Radha Madan Mohan Temple is a must see site for tourists. Established by the ISKCON (International Society for Krishna Consciousness), the shrine is revered as a milestone of the Hare Krishna Campaign. Other important places to visit in Ujjain include Kal Bhairava, Bade Ganeshji Ka Mandir, Pir Matsyendranath, Bhartrihari Caves, Chintaman Ganesh, Maa Wagheshvari, Durgadas Ki Chhatri, Kaliadeh Palace, Vedha Shala, Bharatiya Vidya Bhavan Museum, and Vikram University. Hiring a taxi in Ujjain will help you enjoy the tour in Maharashtra and areas around better. In case, you are visiting Ujjain in the near future, we are here to make it the most comfortable and hassle free trip. Visit us online or our branch office personally in Madhya Pradesh for an unforgettable tour experience. At My Taxi India, we ensure you proficient and state of the art car hire and airport transfer service.